Released: 1992. Genre: 2D Platformer. 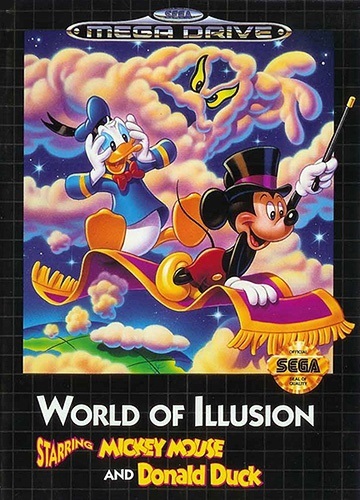 World Of Illusion stands as a glittering, long-lost reminder of why we should never accept as-given that games aimed at younger children should be bland, visionless advert hoardings that parents only buy because of the cartoon character on the box. 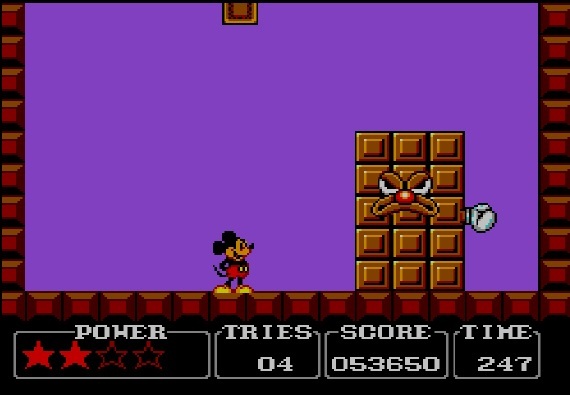 Whilst many 21st Century Disney game licences have been subdued by derivative, mediocre design and an ever-present taint of corporate poison, by contrast, the SEGA-developed World of Illusion brims with beauty and imagination. 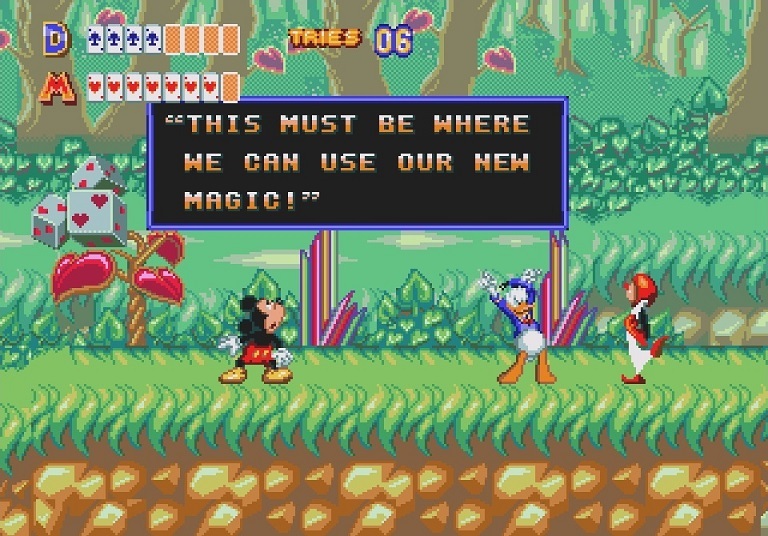 The successor to the hugely popular Castle Of Illusion, WOI sees Disney icon Mickey Mouse back for another 2D platform adventure, only this time he’s accompanied by his old pal Donald Duck. As the two ready themselves for a theatre performance, they happen across a mysterious portal back stage. The bad news for them (and good news for us) is that it leads to a wondrous and dangerous world of magic, in which the pair must traverse a sequence of Disney-themed levels before confronting the evil Magician responsible for them being there in the first place. 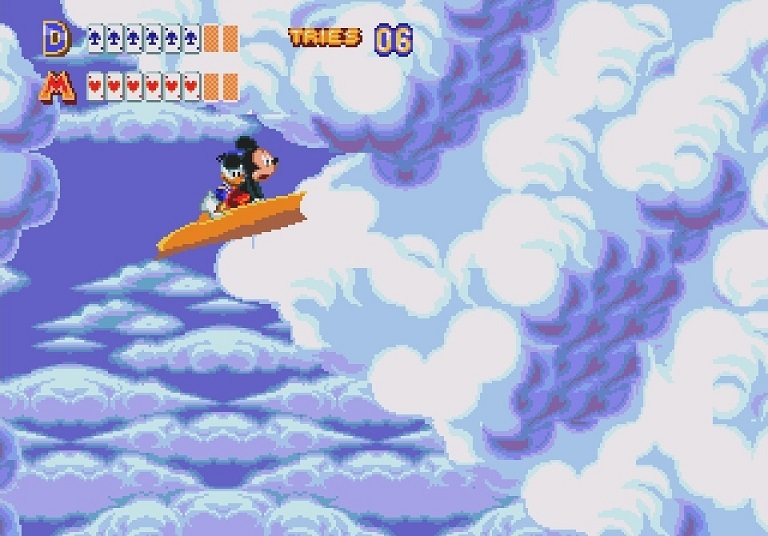 Most immediately striking about World Of Illusion is its gorgeous visuals, of which there is so much that’s praiseworthy, it’s difficult to know quite where to begin. Character animation seems as good a place as any, as it's exemplary. The look and movement of Messer’s Mouse and Duck is spot-on, right down to the little details, such as when they stand too close to a platform edge and start theatrically wind-milling their arms. Then there’s a host of amusing co-operative skits, like when Mickey has to help pull Donald through crawling-gaps that are a wee bit too narrow for the plump duck. More noteworthy still is that the standard of enemy design is also outstanding, with each level showing off a range of new and remarkably creative foes based on the theme of the environment, with no reliance on palette-swaps. And this is indicative of a breathtaking fusion of visual beauty and care-in-design that results in the player feeling like they’re immersed and involved in an actual Disney picture. The whole effect seems so effortless, and that’s only because every facet of the presentation is near-faultless. This naturally extends to the soundtrack, providing the perfect chirpy accompaniment to each escapade. The audio landscape is awash with whistles, flutes, banjos, harps and trumpets – it’s like SEGA managed to cram an entire Disney orchestra on to the cartridge. Would the underwater sections have been as atmospheric had they not have been matched by a slow, infectious and mysterious chiming, beckoning the player further into the unknown? Perhaps the most remarkable part of the score is the intoxicating, spine-tingling theme of the Magician Realm that serves as the final section; it’s a tune so layered and rich-sounding, you’d scarcely have believed it could have been achieved on a Mega Drive. There’s even a “wow!” or two from Mickey and Donald, and you know what? They’re great too. Disney influences are incorporated with style and panache in a dazzling array of environments. No sooner have you passed through an enchanted forest with remarkable, multi-layered back and foreground details lending it the illusion of depth, than you’re met with shades of Aladdin as the player soars through the sky on a magic carpet. The underwater sections, which bear more than a passing turquoise resemblance to The Little Mermaid, see the heroes enveloped in a bubble as they swim, fending off snapping piranhas and tricking clams into opening up routes blocked by streams of air bubbles. There’s even time for a bit of Alice In Wonderland, with mazes, mysteries and men dressed as cards. It’s a wonderful adventure for the youngsters. Yes, it’s too short and too easy for seasoned gamers – there’s a password system as well as infinite continues, and those with their wits about them will plough through it in around an hour first time – but the gentle difficulty shouldn’t be mistaken for a lack of gameplay. There’s ample ledge-hopping, enemy-swatting fun to be had thanks to some sublime controls and the game throwing something different at you with every new screen, it’s just considerably more forgiving than its contemporaries. 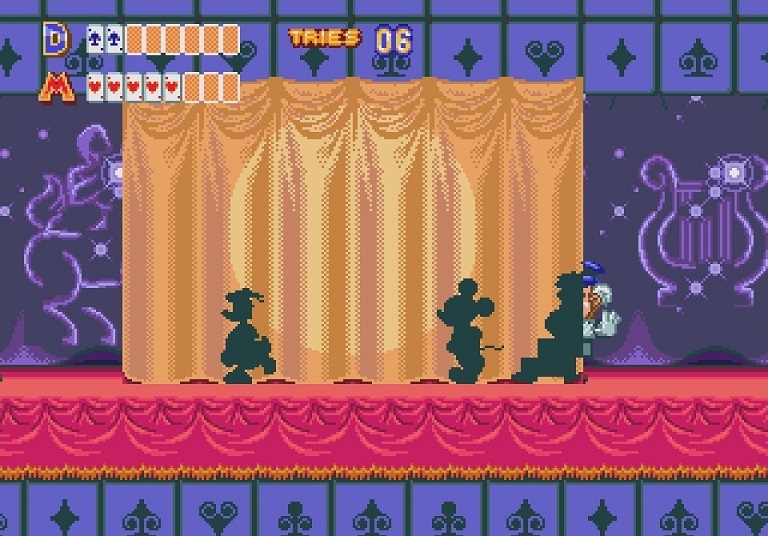 Recognising that the game was easier to beat than Castle of Illusion, SEGA went the extra mile in providing this platformer an unusual (at the time) element of replay value, namely that there are three different means of playing through the adventure. 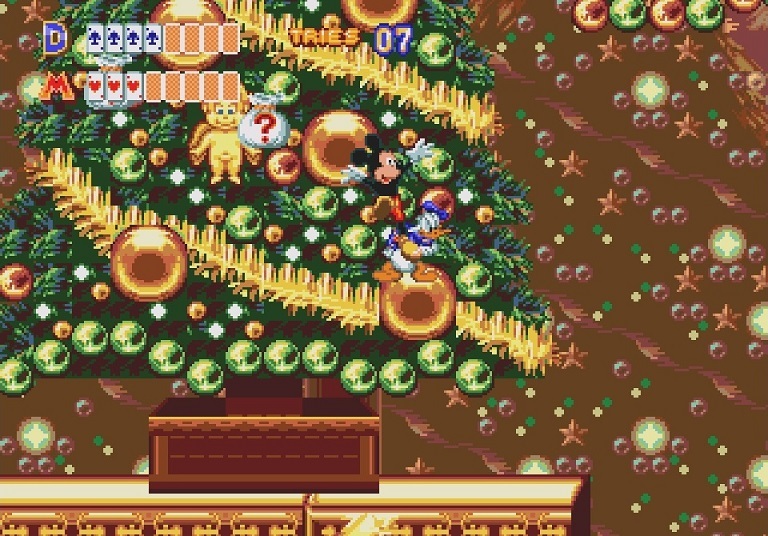 Whilst core areas remain the same, playing as Donald and Mickey reveals different sections within each individual level. 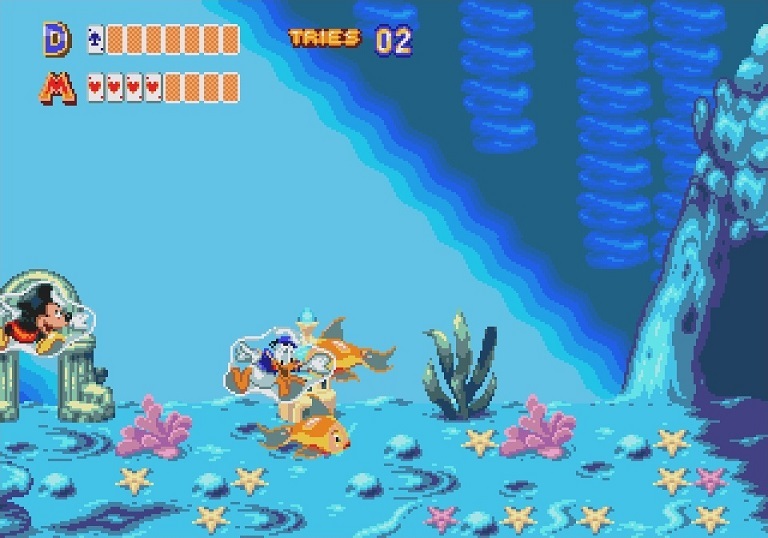 Mickey finds an underwater ruin of sorts, but unable to reach it on his own, Donald has to brave the beaches and dinghies of the island above instead. Elsewhere, Donald gets the thrill of riding a leaf down a hazard-strewn waterfall, whilst Mickey has to make do with piloting a champagne cork into space for another glorious vignette. The third form is the best though; playing cooperatively with a friend. Not only does this add further sections that aren’t present in either single-player adventure, many are tailor-made to incorporate and encourage teamwork. 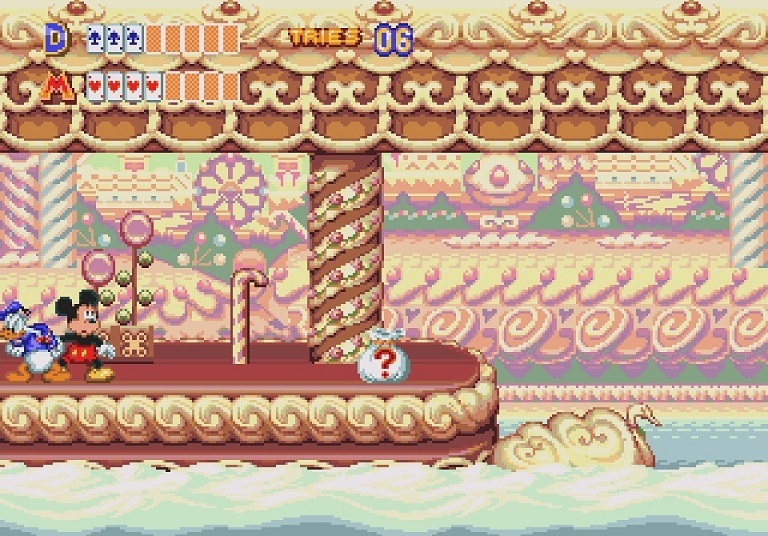 There’s a sequence that has players jointly working a mine cart by bouncing alternately on levers, and with ledges often proving too high to reach single-handedly, one of the pair must get a boost from the other, before lowering a rope down to help their pal climb up. Simple, measurable longevity may be in short supply, but unlike a great many longer platformers of the time, I’ve been compelled to return to World of Illusion countless times over the last twenty years. 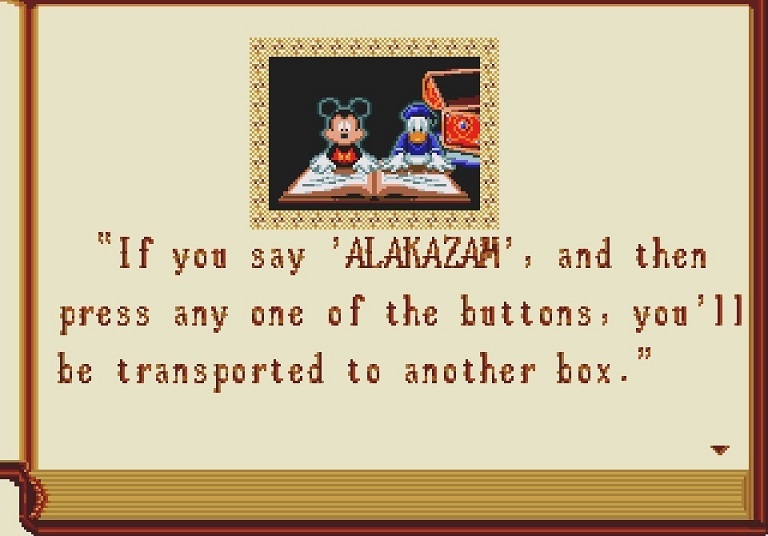 World Of Illusion is a sterling effort from SEGA. Few video games, from any era, have embraced and utilised Disney’s assets, qualities and ideas in so complete a fashion. It’s short, and it’s easy, but if you’re ever left with that nagging suspicion your five year-old deserves something more imaginative than the gaming equivalent of beige wallpaper, then there’s always this lingering evidence that sometimes, just once in a while, those who have a licence-to-print-money land in their laps still want to make a great game, and World of Illusion is just that.